Advair is issued to treat some symptoms of asthma, particularly shortness of breath and irritation of airways. The use of Advair will open said airways and protect them from irritation. 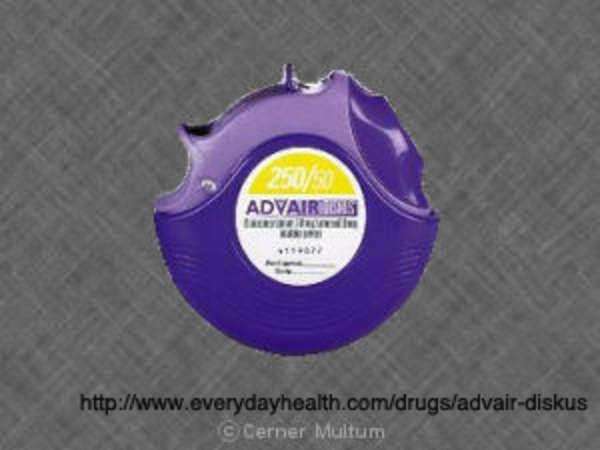 Advair is inhaled and delivered through an inhaler for quick access to lungs and the airways. Advais is never to be used during an asthma attack; the medication is not used to treat or cure asthma, but it is effective in preventing said attacks from occurring in the future. Advair is only available through prescription and you will need to speak with the doctor to have your risk factors assessed to ensure that the medication is safe for you. If prescribed, you will be monitored during the first few days of treatment to ensure a natural bodily response. If adverse reactions or side effects are observed, your physician will alter the dosage or discontinue use. To ensure a safe treatment plan, be sure to note all changes or side effects, however minor, and report these accordingly. A few conditions that might prevent you from using Advair include certain food allergies, diabetes, infections or seizures. Many of these preexisting conditions will cause an unsafe interaction with Advair, thus necessitating a disclosure of your medical history to your doctor. You will use Advair once a day unless your doctor informs you otherwise. You are never to skip or double up doses, as this is dangerous and unnecessary. You should skip a dose if you have forgotten and are close to the next scheduled dose. In doubt, it is always better to avoid “making up doses” when you forget to take the drug. Consistently taking Advair at a scheduled time is generally necessary to ensuring a proper dosing regimen. Procuring free non-prescription drugs is rare, and Advair is no exception. The drug’s manufacturer, GlaxoSmithKline, offers promotions to first-time users. These coupons will consist of a free or lowered trial run that lasts no more than a month. There is a general $10 coupon to reduce the price of Advair.